100% custom design and print. We add your company logo for no additional cost! Choose from Static Cling or Removable adh. Same price! Make your oil sticker into a Promotion Coupon. It's easy! Custom oil change stickers WILL increase your sales. 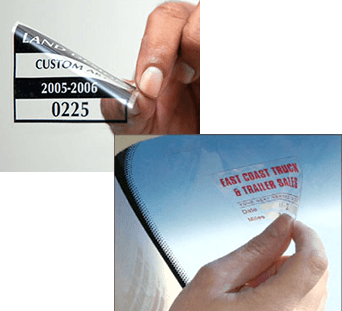 Your custom oil sticker orders ship in only 7-10 days. Your 2" x 2.5" custom oil change stickers will come in rolls of 500. Oil change reminders are the most cost effective, easy, innovative and effortless marketing tool of recent times, and they offer a valuable and practical service to the end user. 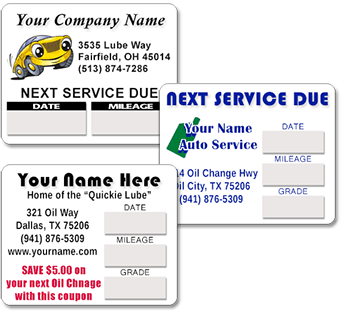 Oil change stickers are low in price and serve as effective marketing tools. Many companies now prefer these service reminders as one of their primary methods of advertising. We do not believe in a one-design-fits-all custom oil change sticker. 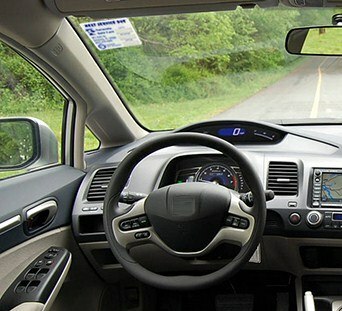 You have the option to choose from one of the typical basic layouts OR you can opt for something totally custom. We send you a proof and you can request changes, all at no charge. Custom fonts, styles, etc. It's all about what you want. None of the boring stuff like you get from the other guys. We will add your company logo to your custom oil change stickers at no extra charge. Branding is important to your company, your image, and your reputation. Take advantage of this opportunity to advertise your company. Be sure to take the time to learn about Static Cling and Removable Adhesive custom oil change stickers. You may find that one better suits your particular needs. While many others try to get more for removable adhesive, calling it a 'premium", we charge the same price. Fair is fair. Honest is honest. You have a free promotional coupon opportunity at your fingertips! 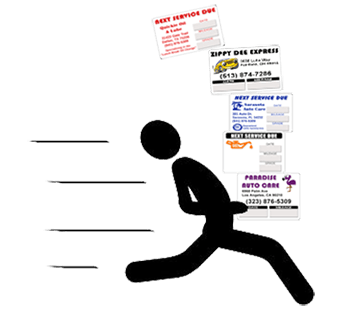 Give your custom oil change sticker real value and lure your repeat business right back in. 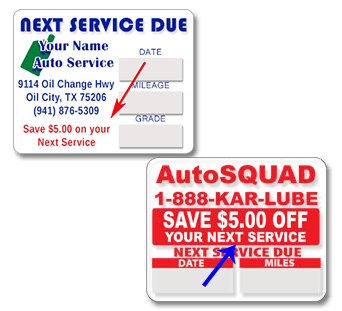 Make your custom oil sticker a promotional coupon by offering a discount on their next service at your location. This will make sure they leave your sticker in their window, in their face day after day, and then return back to you for their next service. As soon as a person gets into their automobile, they are immediately presented with a subliminal sales message, in the form of a static cling oil change sticker. You are providing value to your customer with a Next Service Due reminder and advertising your business, the entire time that they are behind the wheel. There's quite a bit that goes on behind the scenes when making your custom oil change stickers. Artwork design. Pre-press setup. Printing plates are made. Efficient scheduling to keep your costs low. Printing. Slitting, Inspection, then Shipping. That's a whole lot of love from a whole team of people that personally goes into your custom oil change stickers. large order quantities. Go digital for small runs. Removes cleanly, without leaving residue. The perfect, low cost non custom oil change stickers. Available in Static Cling or Removable Adhesive.